Polyester capacitors also are known as Mylar or PET capacitors are used as leaded capacitors in many applications. They are used mainly in their leaded form. They are not produced as high tolerance capacitors, but they have a low ESR and are able to tolerate large spikes with a high rise time. It is the properties of this dielectric that gives the polyester capacitor its unique properties. The polyester dielectric uses a polyester film for its dielectric which sits between the two capacitor plates. These capacitors also are known by the trade name Mylar capacitors as this is a trade name for the polyester dielectric film used. Also, the capacitors may be referred to as PET because the synthetic polyester material used goes by this abbreviation. Polyester capacitors are based around the use of a polyester dielectric. The polyester dielectric based on a category of polymers that contain chemical esters their main polymer chain. Although there are many polyesters, the term “polyester” as a specific material most commonly refers to polyethylene terephthalate, PET. As with any capacitor, polyester capacitors have their own characteristics. This means that they are suited to some applications more than others. 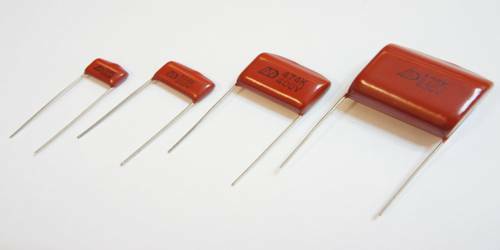 Leaded versions only: Polyester capacitors are only available in leaded versions, and are not available in surface mount packages. High dielectric strength: The polyester dielectric used in these capacitors also referred to as PET offers a high dielectric strength. This means that high voltage capacitors can be made relatively small. Operating temperature: As a result of the properties of the polyester dielectric, these capacitors are often able to operate up to temperatures of 125°C, although with a voltage de-rating. ESR: Polyester capacitors are able to provide a low level of equivalent series resistance. High dV/dt: The construction and dielectric of polyester, PET capacitors means that they are able to be used in applications where sharp, fast rise time spikes are present as they are able to accommodate high dV/dt figures. 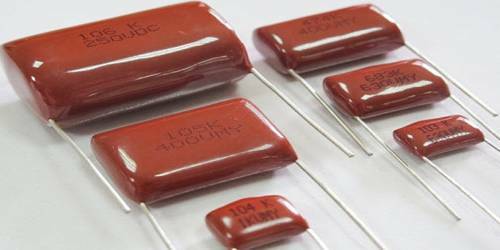 Tolerance: Many polyester film capacitors have a tolerance of only 5% or 10%, which is adequate for many applications but for all applications as much better tolerance capacitors are available at a lower cost these days.